Sprucing up the house | Que Sera Sara? In a bout of unprecedented domesticity, we spent part of our weekend in Homebase. Coming home after such a long absence has been a blessing and a curse. I feel a renewed sense of purpose and focus now my life has been thrown into rather sharp relief. But I also spend everyday surrounded by the unfinished tasks and half-baked ideas that I never quite got around to. And our house is a pitiful reminder of my procrastination and laziness. So as the days get short and the nights get cold, we find we are both keen on a little nesting. Making our house feel like ours. Starting with the hideous colours. The back bedroom has this amazing south-eastern light. And it’s painted this awful grey-blue colour that kills all its warmth. Hence, to the paint store! We shall heretofore bask in the warm glow of weekend mornings. And Bean will know the blistering joy of masking tape and foam rollers for the first time. And since I may well be living with them up there for a week or eight (let’s face it, my new lease on life does not put more hours in the day), I decided they may as well be attractive. 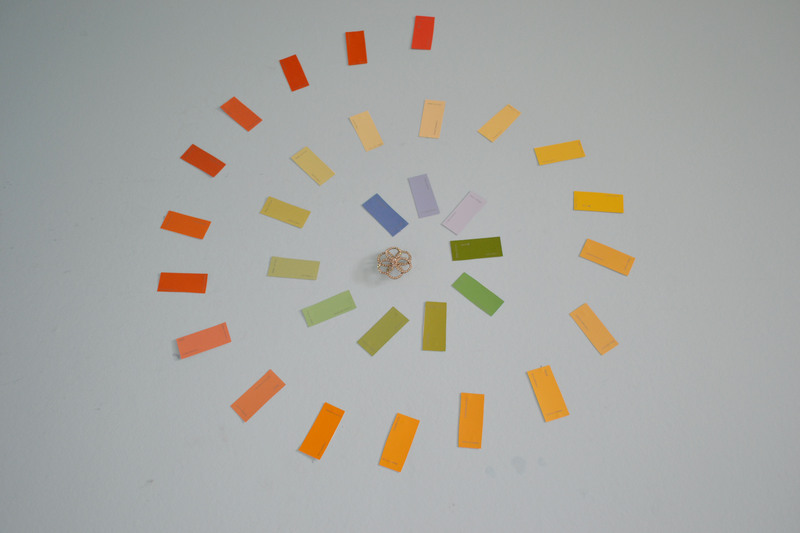 So I made a colour wheel of impromptu wall art. And stuck my much-missed Grandmother’s brooch in the middle for good measure. I’ve not got my heart set on any yet. But Flame Frenzy may sweep the Best Name category.